Gode gamle fejl / Good Old..
Site specific work for Byens Hegn (a green fence surrounding all metro building sites) in Copenhagen, located in Fælledparken. 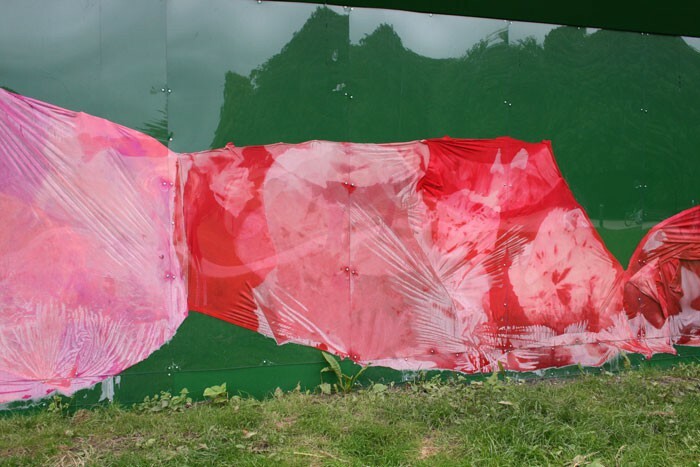 On 55 meters of the green fence, red, bleached swimsuit fabric is clamped between the fence and large sheets of polycarbonate. Condensation develops in some areas, due to the changing weather and the position of the fabric, and it blends with the bleached areas of the fabric. The work has been developed specifically for the selected section of the fence.